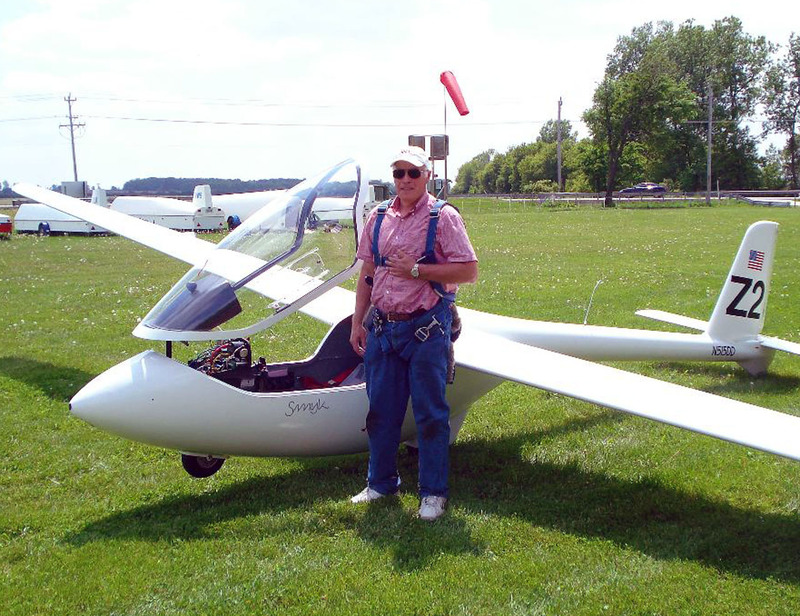 It has been said that the best way to learn to fly is in a sailplane, where power is provided only by air currents and gravity, and a pilot learns the fundamentals of flight with an incomparable clarity. In a glider, energy management becomes an art and every landing requires precision. Several weekends ago, I was passing through Harmony, IL when a sailplane appeared, turning gracefully to a hushed landing. As a place, Harmony, is much like our familiar Greenwood, an unincorporated bit of a town that is forced to use a mailing address other than its own. In this case, the USPS considers Harmony to actually be Hampshire, IL. However you refer to it, it’s home to a grass strip where only sailplanes live. 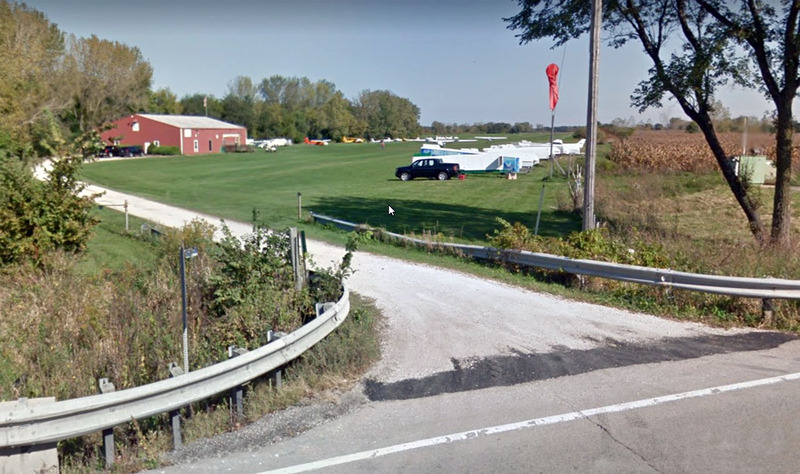 I stopped to watch, then located the gravel track off of Route 20 that leads to a combination clubhouse/hangar and a grass strip where several sailplanes gathered. The building and adjacent runway belong to Sky Soaring, a club founded in 1972 by a group of area sailplane pilots. It was a beautiful summer day and a number of people were watching and participating. Exiting the car, I was fortunate to make the acquaintance of John Osborn, a glider pilot, who graciously took the time to explain what was happening and to give me a tour of the club’s hangar. Among other items, that hangar housed a large flatbed truck with a huge engine and a rear-facing seat mounted in the bed. Large metal spools of Spectra rope were attached to either side – one yellow and one red. 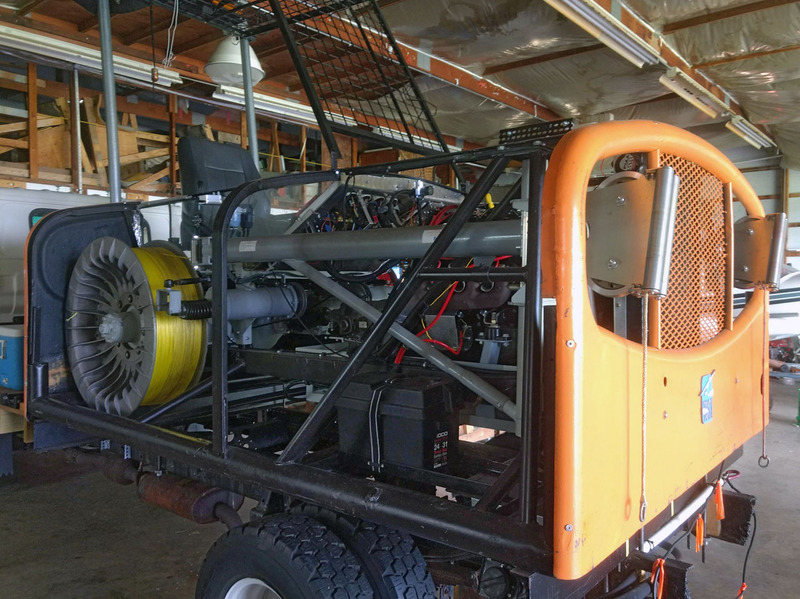 This was TOST, a double aero-winch unit from Germany that had been assembled onto the truck bed and used a high-output 450 hp V8 engine to power it. The side drums each held 3,400 feet of polyethylene rope that looked way too thin to pull a 1,200 pound glider into the air. However, John advised me that the Spectra rope is actually stronger and lighter than the steel wire used in earlier days. On this day, the club was using their C182 tow plane to launch gliders, so unfortunately, I didn’t see the winch in operation. However, John lead me through a typical winch-launch operation. The truck-mounted winch system is positioned at the far, upwind end of the airstrip. The two drums on either side allow for the staging of two gliders at the downwind end of the 3,400 foot field. The ends of each rope are drawn from the winch to the opposite end of the runway by a “mule” car with a wide, folding cross bar on the roof that keeps the ropes from twisting into a colorful Gordian knot. Two gliders can be cycled in under 4 minutes. One-half of the length of the rope as stretched out on the ground is approximately equal to the maximum altitude that can be attained by a sailplane using the winching process. A short rig made up of sections of rope that join a parachute and a “weak link,” is attached between the rope and the sailplane. 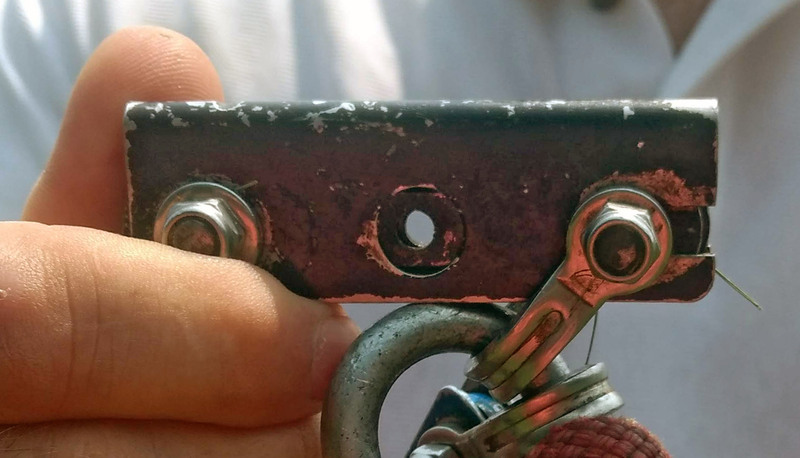 The weak link, a color-coded piece of steel with a specific shear value, prevents over-stressing the wings during the launch. Each pilot is responsible for choosing the colored link required by his particular aircraft. After the tow rope is released by the pilot, the small parachute provides tension to the line so that the winch driver can respool it in a controlled manner as it falls to the earth. A ground support team consisting of three people is needed to winch-launch a sailplane: a Wing Runner, a Winch Driver and a Launch Director. The Wing Runner has a number of responsibilities including staging the ropes and their hardware, connecting the rope to the glider and holding the wing level during the launch. The launch itself is controlled by the Launch Director. Using a dedicated phone system, the Launch Director communicates with the Winch Driver at the other end of the field. He also communicates with the glider pilot during the launch. The Winch Driver controls the speed of the rope and manages the power output of the engine with input from the Launch Director. The Winch Driver receives a 2-minute warning, He starts the big V8 and lets the Launch Director know when the winch is ready. For safety, the tow rope isn’t attached until after the pilot secures his canopy. From that point, the launch is considered to be on. The Wing Runner attaches the rope to the glider then moves out to a wingtip to level the craft and signals to the Launch Director that the glider is ready. The Launch Director makes a final check for air traffic, insures that the runway is clear and notifies the Winch Driver to take up the slack in the tow rope. As soon as the line goes taunt, the director calls, “GO, GO, GO!” into the phone. At that stage, the only way to abort the launch is for the pilot to pull the rope release. No one else can stop it. Within the first 2 seconds, the sailplane is airborne, flying level. The use of the word “Launch” is no exaggeration. As soon as the pilot feels aileron authority, he pulls the sailplane into a 45-degree climb, while carefully watching the airspeed. The Winch Driver receives instructions from the Launch Director to adjust the throttle on the big V8 as needed. The pilot and the Winch Driver have no direct communication. All communication with the Winch Driver goes through the Launch Director. 25 seconds pass. The rope is now at an approximate 70-degree angle to the ground and the sailplane has reached its maximum launch altitude. The pilot pushes the nose over, releases the tow rope and sets a slightly nose-down attitude to maintain airspeed. The glider will also automatically release from the tow rope once the glider goes beyond a 70 degree angle. A typical launch will achieve 1,000 feet AGL. A good wind from the runway heading may allow it to attain 1,500 feet AGL. The entire flight will last 10 to 12 minutes. In Spring, when the ground is warming, an experienced pilot, searching out thermals, can extend the air time while flying a considerable distance and still be able to return to the field. In contrast, the use of the tow plane for an aero-launch will typically take the glider to between 2,000 and 3,000 feet AGL resulting in a flight of 20 to 30 minutes. The higher altitudes make it more likely the glider pilot will find lift and fly away from the field. 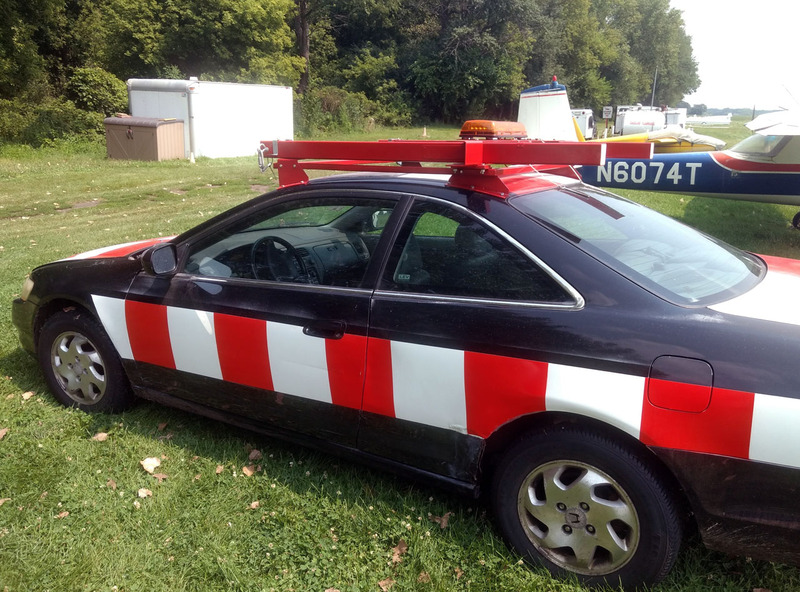 The aero-tow process is somewhat less regimented, requiring only two pilots, but if other people are around, one will usually offer to serve as a Wing Runner. 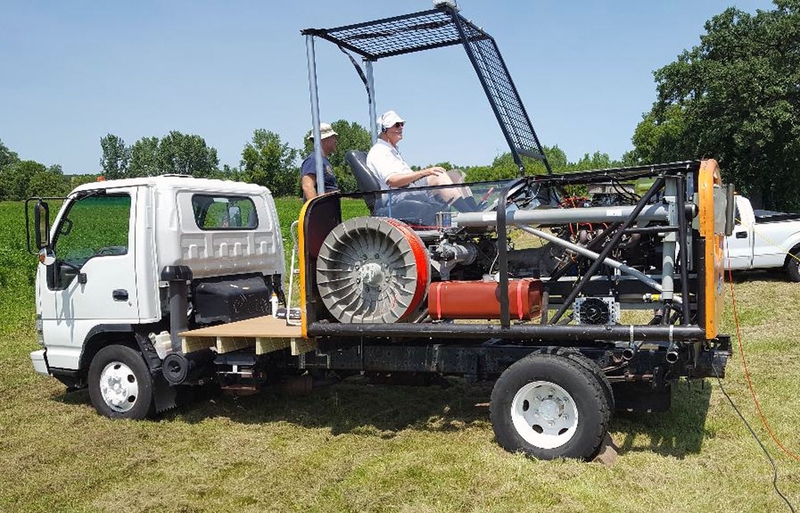 An aero-tow will cost the pilot $45, quite a bit more than a winch launch at just $10. I asked John how long it takes to earn a glider rating. He replied that a rule of thumb is that a student’s age is equal to the number of flights it takes before soloing. Therefore, a 14-year-old could quite possibly solo after 14 hours of instructor flights. Doing the math in my head, I quickly realized that, at my age, I probably couldn’t afford the training. 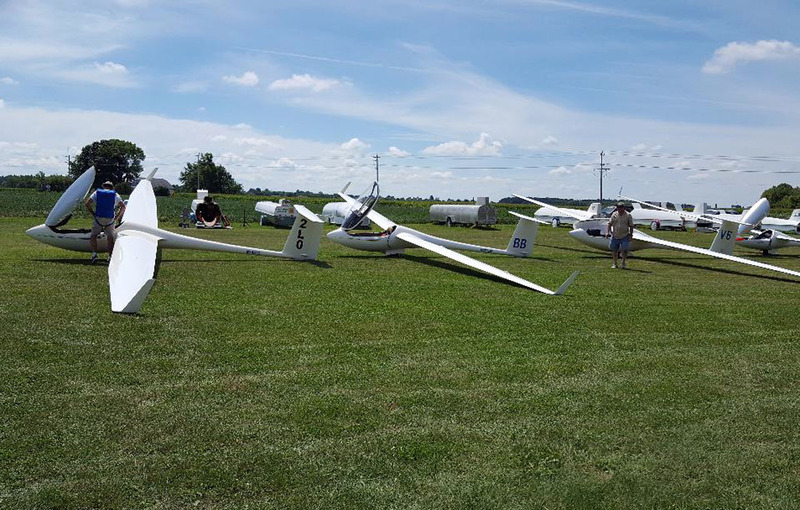 The club currently has about 85 members, owns five sailplanes of various configurations, a C182A tow plane, and has one of the most active sailplane flight training programs in the Midwest. Or, if you just feel like doing some exploring from behind the wheel of a car, head on out in search of Harmony! Time is running out and YOU have the opportunity to help shape the direction and character of our EAA Chapter. The positions of President and Secretary come up for election this coming month. This is your chapter, and your participation is essential to our continued success. Please consider running yourself, or nominate someone that you believe can help move us into the future. Please, no for-profit business ads, just aviation-related items that may be of interest to other members. Trade it, sell it or give it away. We’ll run your classified/want-ad for as long as we think is reasonable. Email your text and even a photo to editor@eaa932.org. Flying has taken part in our lives together from early on. Although put on hold for a very long time, we are happy to be back and involved. I met my husband Chad when I was instructing and took him on his very first few flights. After we were married and raising a family, I took a break. The break lasted nearly fifteen years though, and the return was prompted by Chad’s interest. Chad began working on his private this past year. His nose barely comes up from his books some days and aviation YouTube videos stream daily. He truly loves it! We are raising three kids together. Tyler, 11, Brennan 8, and our little girl, Charlotte, 5. We are very excited to be a part of the friendly community at Galt. Thank you for the warm welcome! On Saturday September 29th the Blackhawk Area Council of the Boy Scouts held their AirCamp event. AirCamp is a gigantic outdoor weekend encampment that is organized every four years for scouts of all ages. 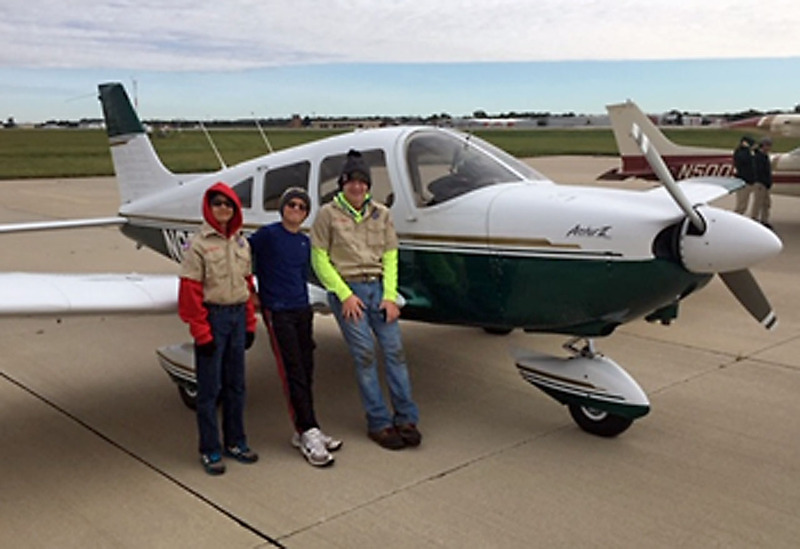 Thousands of scouts attend the event that is held on the grounds of Chicago-Rockford International Airport (KRFD). 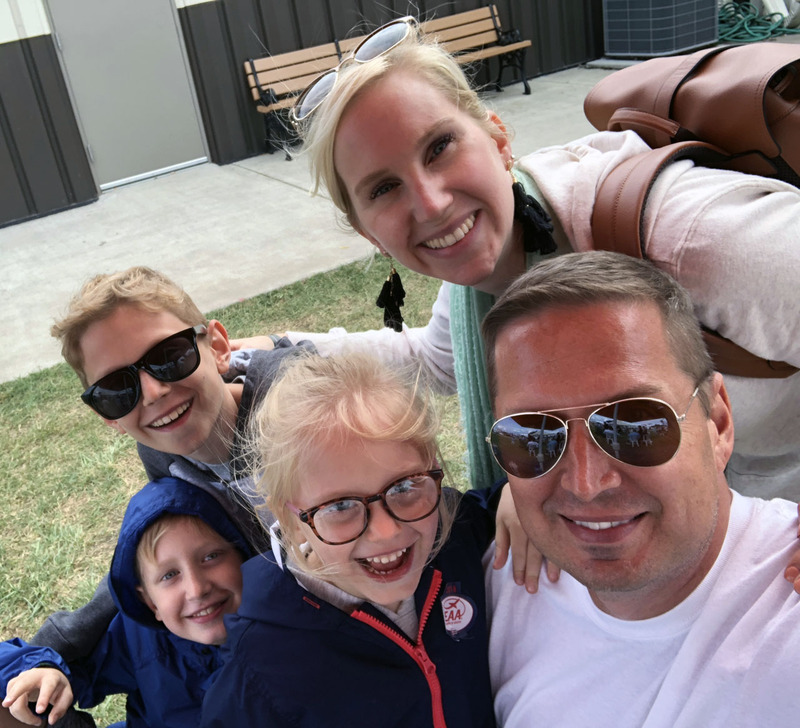 Highlights of the event include various static displays of aircraft, rocket building, climbing towers, zip lines, archery, BB guns, GPS exercises, and EAA Young Eagles flights to name a few of the many activities that take place. Highlights of the static displays included an American Airlines Boeing 737, a UPS Boeing 757, a flight for life helicopter, various military aircraft, and Illinois State Police aircraft amongst many others. A major part of the event is a massive Young Eagles Rally. The rally was organized by Young Eagles Coordinator, Scott Crane from EAA Chapter 1414 at Poplar Grove Airport. Scott was able to recruit 17 airplanes from 7 EAA Chapters around the Chicago area. 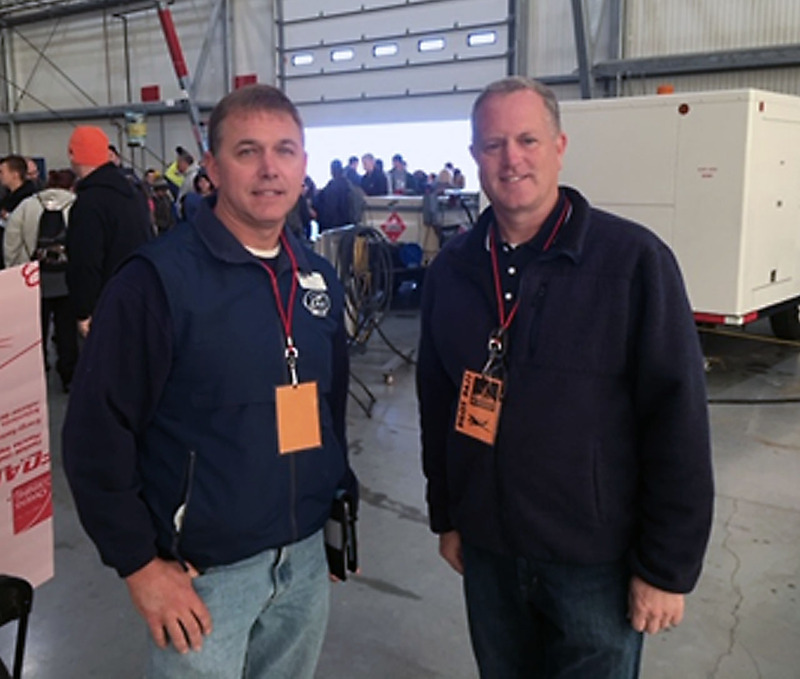 Myself and EAA 932 chapter member Dave Dahlburg represented our chapter at the event. During the pilot briefing, Scott announced that among the 17 pilots participating, he researched that we all had 2100 Young Eagles flights over our histories as Young Eagles pilots! The weather for the event was near perfect. The skies were high overcast, with temperatures in the low 60’s. The air was silky smooth. Perfect ingredients for flying Young Eagles! Dave and I each flew 9 Young Eagles for a total of 18 kids flown. After the event, Scott Crane announced that a total of 240 Young Eagles were flown among the 17 participant pilots. What a great day! 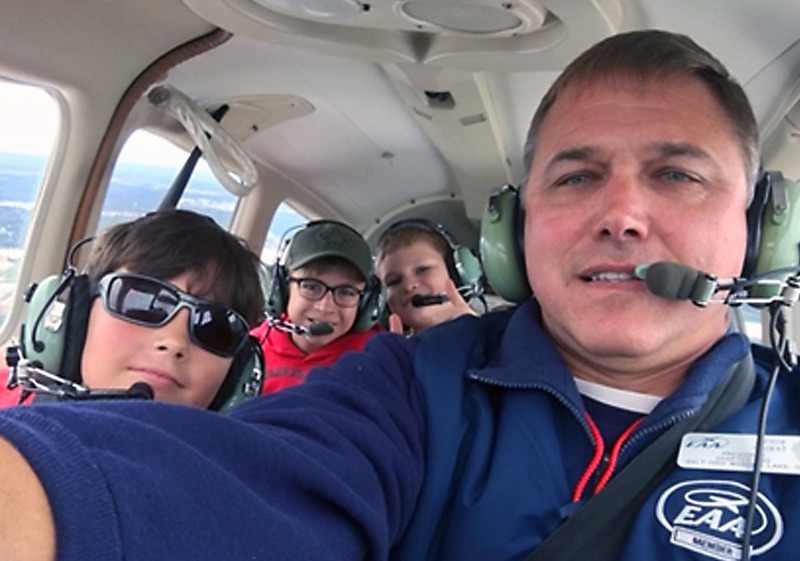 The EAA Young Eagles program has been around since 1992, and since its inception has given the opportunity to provide a flight experience to millions of kids between the ages of 7 to 18 years old. I always enjoy seeing the smiles on the kid’s faces who have the opportunity to experience a Young Eagles Flight!!! or nominate someone that you believe can help move us into the future. EAA Chapter 932 is now posting more chapter information, events and links to items of interest online. Our presence on Facebook has consistently reached people in our community for the past six years. 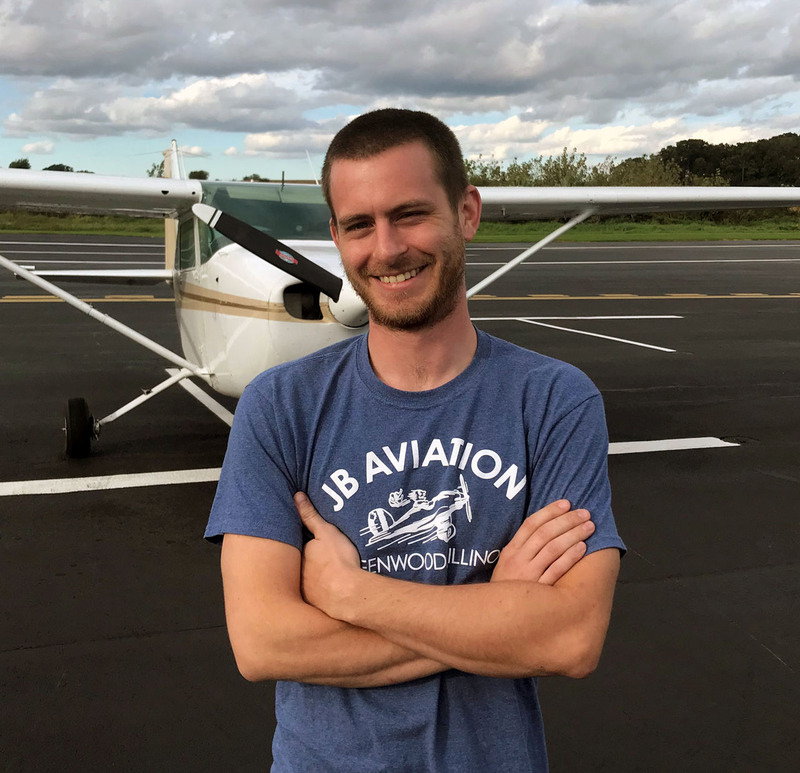 Thanks to Justin Thuma, our 2018 Ed Moricoli Memorial Scholarship winner, EAA932 is now on Instagram and Twitter, as well! The addition of our Instagram account allows us to share photos and events easily on all platforms. If you haven’t already, please LIKE us on Facebook, and follow us on Instagram and Twitter. You are welcome to post your chapter-related photos on Instagram with #eaa932. 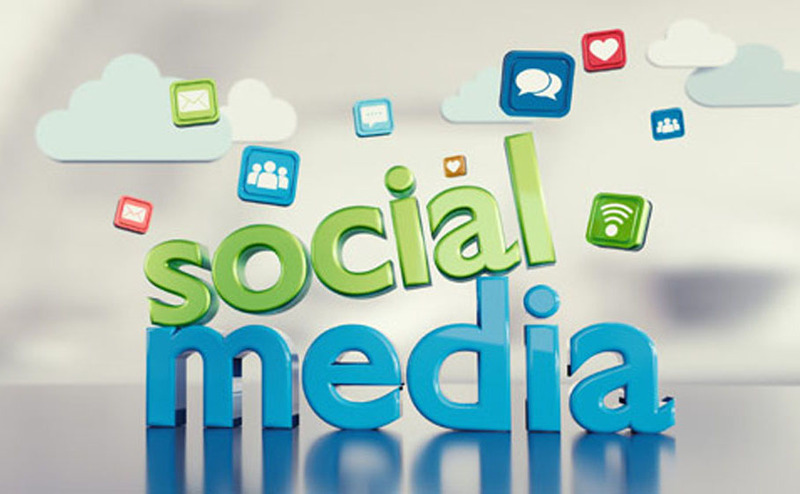 Why increase our social media exposure? With social media we have the ability to inform and guide our own positive narrative on a mass scale. We need to be seen, heard and remain relevant in sharing all aspects of our wonderful hobby. EAA chapter presence online helps hundreds of chapters communicate and collaborate to share our stories and promote our vision. 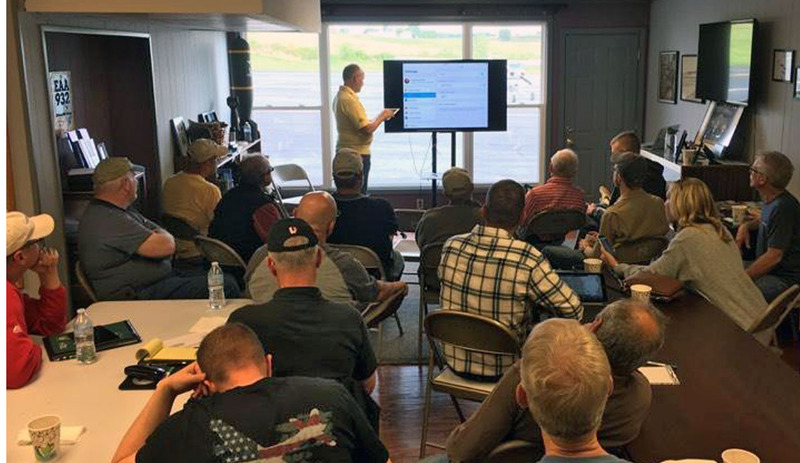 By reaching out into the online aviation communities and supporting online grassroots efforts to promote aviation, General Aviation can continue to thrive and carry out the EAAs mission to share the Spirit of Aviation. I know...I asked this question in the September issue. Unfortunately, the email links weren't working in the PDF version ("So hard to find competent help," the editor mumbled...at himself), so I'm asking for your opinions on this once again. NOTE: Dorothy, Andrew and Vincent, I did receive your preferences and will include them with replies from this month, I promise! To everyone else, let me know what your favorite Weather App is and why. I’ll put all the ideas into an informative article so that the opinions can be shared with the EAA932 membership. Who knows, maybe we'll all discover new favorites! Do you have a bucketful of old Clecos you would really like to get rid of? Are you in need of a run-out propeller so that you can make that wall clock for your spouse’s birthday? Please, no for-profit business ads, just aviation-related stuff that may be of interest to other members. Trade it, sell it or give it away, we won’t judge. We’ll run your classified/want-ad for as long as we deem reasonable. Congratulations to Lee Reif! He flew his First solo on 9/4/2018. Congratulations to Robbie Copenharve! 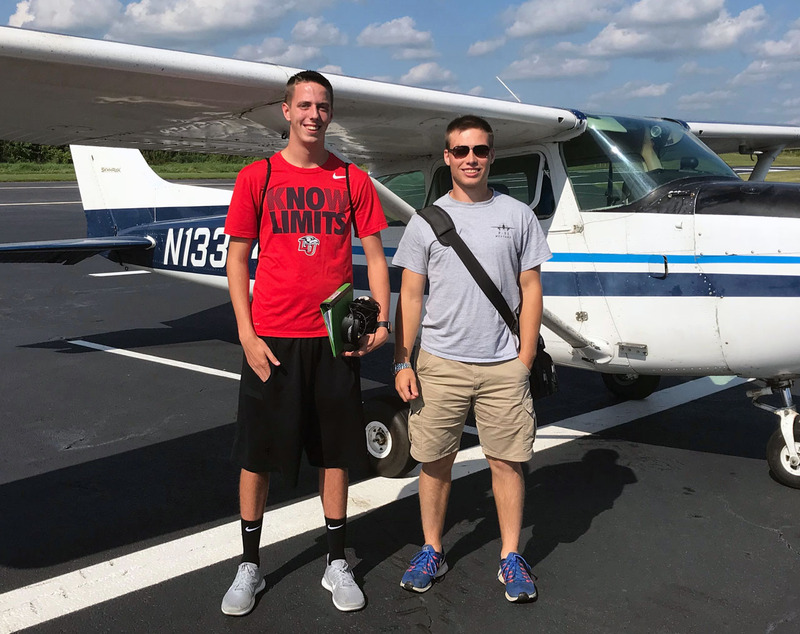 He earned his Private Pilot License on 8/13/2018. Congratulations to Dave Schmitt. 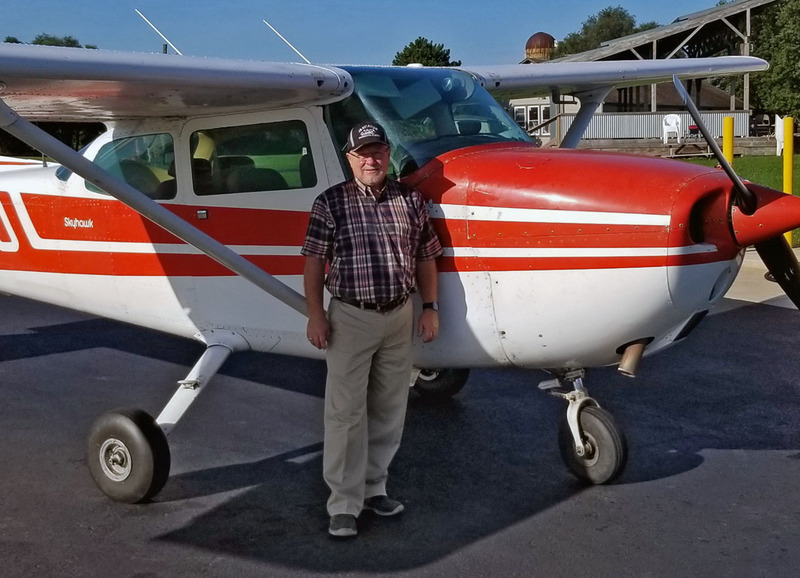 He earned his Instrument Rating 8/8/2018. Congratulations to Jake Berge. He flew his First solo on 8/8/2018. Pictured with his instructor Josh Cramer (right). Adam started flying when he was a teenager after his grandfather convinced him to try it out. He loved it and decided to start training. He managed to solo on his 16th birthday and then got his driver's license later that day. 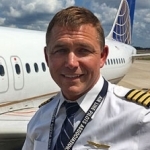 Adam graduated with a Bachelor's degree in Aviation Management and Flight from Southern Illinois University, and is a Commercial pilot single- engine land airplane and, CFI with an Instrument rating. Hello Fellow EAA 932 Members! I hope everyone is doing well as we roll into our fall flying season. There is so much to look forward to as we appreciate the vivid colors of the trees as seen from the air, and the pleasant flying conditions that are upon us! Our chapter continues to be busy as each month passes. On September 8th we had a great chapter gathering that was well attended. It seems when we infuse food along with a good program, it draws a crowd. A breezy but nice flying day also had much to do with an excuse to be at the airport. I would like to really thank Paul Sedlacek for his excellent presentation on Advanced Foreflight. Bill Tobin rocked once again in coordinating the preparation of a delicious pancake breakfast that we all enjoyed very much. Both Marty Papanek and Justin Thuma did a great job cooking for us. All of this set the stage for a nice morning at the airport. I also met a few new faces that have recently joined our chapter. I would like to extend a sincere welcome to all of our new members of our chapter 932 family. 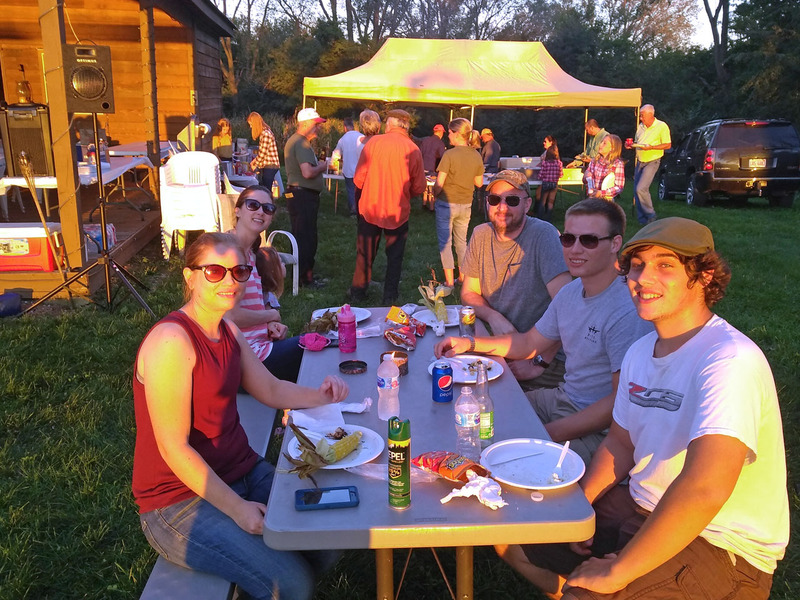 A week later on September 15th we held a family night down by the pond campground at Galt. This was also a fundraising event for our scholarship fund. I was impressed once again with the good attendance that we had despite the tug-a-war with our resident mosquito population! Armed with insect repellent, tiki torches, and mosquito beater we prevailed in enjoying the night with good food, music, games, and a bonfire. Again I would like to thank everyone who came out to enjoy this event and support our scholarship fund. Looking ahead into October we will once again have our annual “Planes and Puppies” event on Saturday October 13th. 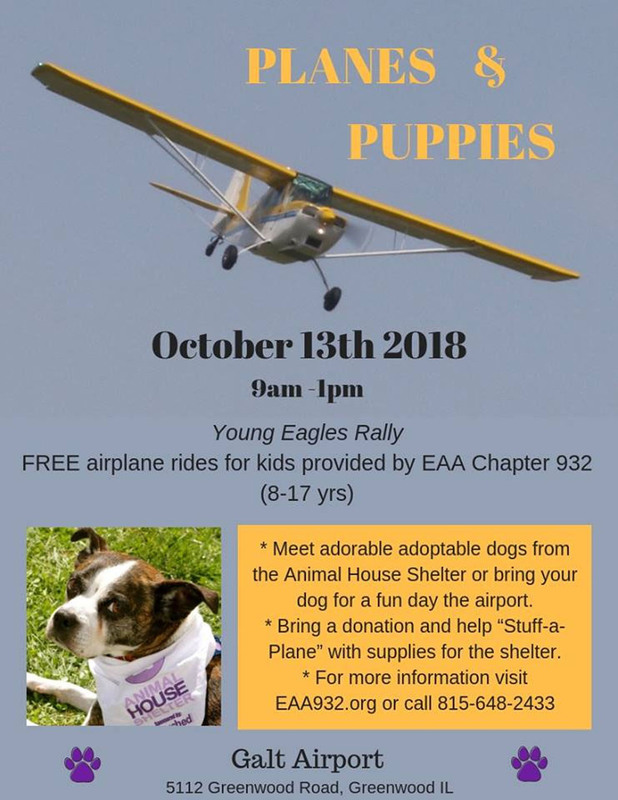 Along with Planes and Puppies we will host a Young Eagles Rally. This event will take place in lieu of our regular chapter gathering. Come on out to support our local animal shelter. Dogs will be available for adoption, and once again we will “pack a plane” full of dog food and pet supplies. Please consider bringing some pet food to stuff into the airplane as a donation. We will also be needing volunteers to help facilitate our Young Eagles Rally. People are needed for ground support, and pilots are needed to fly Young Eagles. If the weather is nice, this event will have a brisk turnout. As always, your volunteerism is greatly appreciated. If you are able to fly Young Eagles, please reach out to me at 815.403.1696, or email to arnie@eaa932.org . For ground support, please reach out to Paul Sedlacek at 847.254.7480 or email at secretary@eaa932.org . 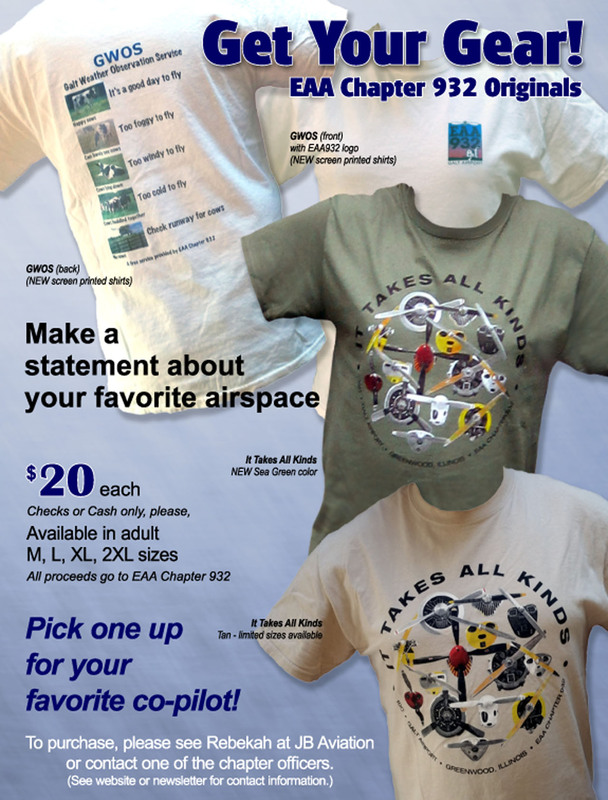 Please also watch our chapter website at www.eaa932.org to stay on top of everything we have going on at EAA 932. Finally, do you or somebody you know have an interest in becoming involved in the leadership of our chapter? If so, the positions of President, Secretary, and Membership Chairman are up for re-election. All of these are board positions within our chapter, and provide a great opportunity to become deeper involved in the EAA. We will take nominations for these positions throughout October, and will hold an election during the November chapter gathering. Please consider serving in one of these positions. For more information, please reach out to myself, Bill Tobin, or Paul Sedlacek. As we make our way through the last quarter of the year, our chapter board will be planning our programs and activities for next year. As we do this, we would really appreciate input from our membership. What kind of things would draw all of you to a chapter gathering in 2019? What things did you like or dislike about what we did this year? We value your opinions and thoughts. As we enter October, I hope to see everyone around the airport. Have a great month, and fly safe!!! !